The Four Winds Renaissance Faire offers the eighteenth annual eight week open tournament to pick the five top Texas knights to represent the state of Texas in the US/International Jousting Tournament held in Estes Park, Colorado every September as part of the Longs Peak Scottish/Irish Highland Festival. During the Four Winds Faire Jousting Tournament, preliminary jousting takes place each weekend between March 3 through April 15, 2012 at noon and 5pm daily. 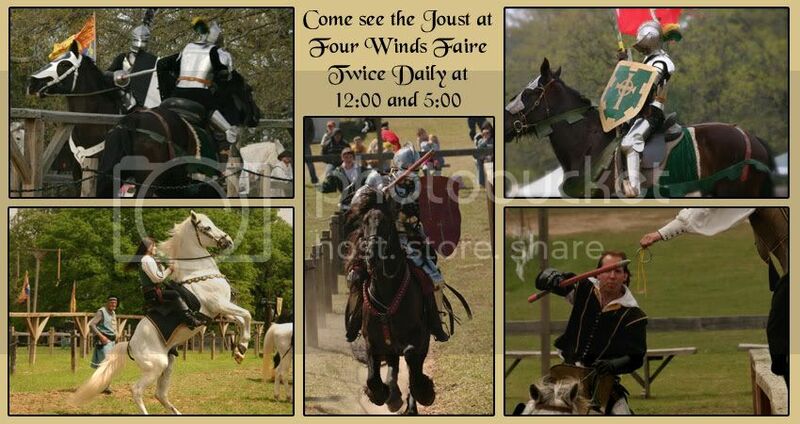 The final jousting competition takes place the weekend of April 21 & 22, 2012. Mounted Combat -- Baston Duello and field battles. Come spend your Day with our knights!